Some gun control groups claim that California’s drop in violent crime since the early 1990s is due to gun control. But a causal review of California gun-related legislation shows that when violent crime started falling in the Golden State, there was no significant gun control legislation. 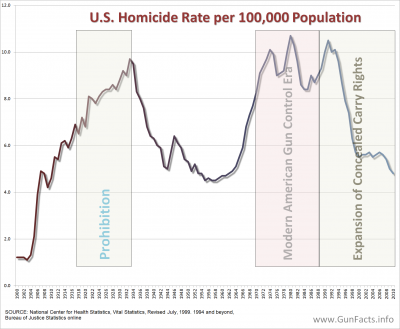 If not gun control, what then explains the drop in violent crime in general, and firearm crimes in particular starting around 1993. My preliminary research indicates it is traceable to California’s Three Strikes law and the firearm penalty enhancements passed in that same year. But it is worth digging into the data to see if we can understand why. 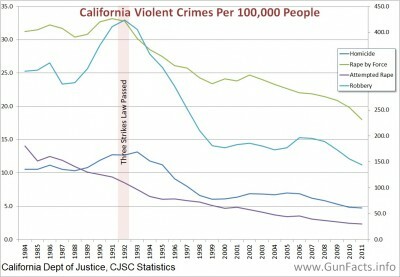 Up to 1993, violent crime in California was significantly higher than the rest of the country. Like most other places, robbery was a leading cause of violent crime. In fact, in the pivot year, robbery accounted for 38% of all violent crime. The rate of robbery as a subset of violent crime is so large, I’m forced to graph it on a separate axis so the other categories of crime are not diminished. My source for the data (California Department of Justice) breaks down the weapons used for robbery, though sadly not for the other forms of violent crime. About 40% of robberies were being committed with firearms in the pivot year, though this rate started to decline shortly thereafter. 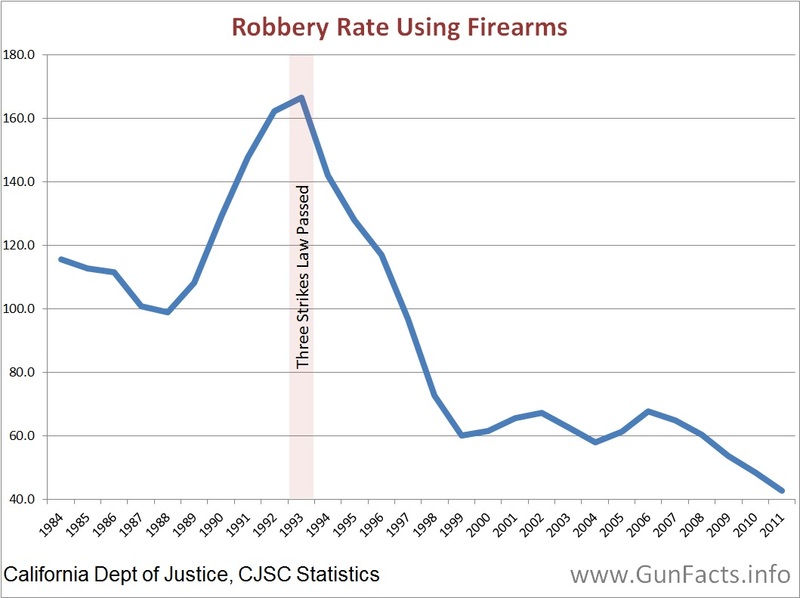 The clearance rate (percent of robberies where someone was charged with the crime) did not materially rise for a few years afterwards, but we know that thugs started going to prison for a minimum of ten years right away. The net results is that though all forms of violent crime fell, robberies fell fastest, in no small part to them being the most frequent to begin with. Unlike homicide, robbery is an income stream and a crime which perpetrators commits with regularity. 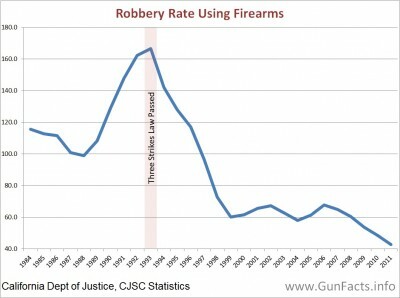 Thus, sending armed robbers away reduced robberies on a progressive scale (on jailed robber would reduce the number of armed robberies by a multiple). 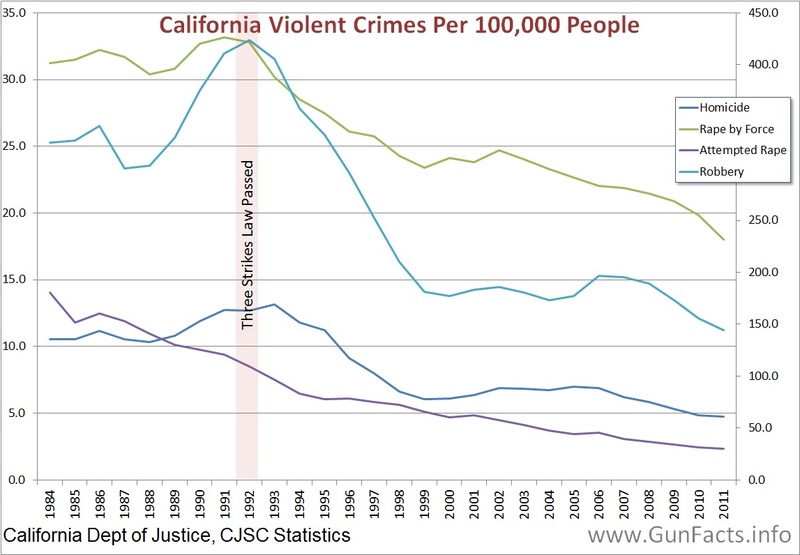 What makes this all interesting is that gun control, the rate of prosecutions, or any other factors had little bearing on driving down California’s violent crime rate. But one law, aimed at bad actors, dropped the primary form of violent crime instantly and significantly. Can distinctions be made between ‘real’ 3rd strike crimes and ‘technical’ felonies resulting in excessively harsh sentences? @William: Yes. I have not done any real work on this, but I know some numbers exist.